Standing beside her several-times-life-sized sculpture, "Sebastian James the Puffin," one of 17 of her works installed at the Smithsonian's National Zoo, Angela Pozzi talked about the puffin's namesake. She created the work the same year her father James died. "He's very dignified like my dad," Pozzi says of the puffin. It stands on a base of just the sort of entangled fishing gear that claims the lives of many ocean birds. The birds often fatally mistake plastic trash for food. These details are noted on a label beside the sculpture. As she discussed the work, made completely out of trash that she and her team retrieved from West Coast beaches, Pozzi spotted litter on the ground. She didn't lose her train of thought as she reached for a discarded food tray. She pitched it in a recycling bin. In Pozzi's sculptures, viewers can make out everything. From flip-flops, toothbrushes and eyeglasses to microwaves, pails and shovels. You can even see car keys. The works have their feet firmly planted in both environmental activism and the art world. Louise Nevelson is a sculptor who created artworks from discarded New York trash. She is an inspiration for Pozzi. Pozzi also owns prints by two other favorite artists, Dr. Seuss and Alexander Calder. Like the two, Pozzi creates art that is both serious and playful. "It has to be good art. Or else it won't do the message," she said on a tour of the works a few days before the exhibition opened. It is titled, "Washed Ashore: Art to Save The Sea." It is at the Smithsonian's National Zoo in Washington. The works are on view until Sept. 5. Despite the nature of the materials, Pozzi and her team at the Washed Ashore project achieve a remarkable and convincing array of textures. The feathers suggested around the puffin's eyes and on his chest lend him not only that distinguished look but also an astonishing naturalism. Pozzi considers her past. She sees a logical progression from her childhood to the art she makes today. "Ever since I was a small child, I would get excited about when the toothpaste started getting empty," she says. "I would get to have the toothpaste lid on top and turn it into a little cup for my trolls. I've always looked at repurposing supplies." She didn't think of the repurposing then in environmental terms. But today, she says standing in front of a fish she made of plastics, scientists applaud her work for its ability to raise awareness. It happens in a way that the scientists can't. "I need to reach inside of people," she says. That doesn't mean doing away with scientific facts. "But you have to grab them. And you have to make them care and you have to get their attention," she says. On the scientific side, the scope of the problem is enormous. The exhibition reflects on the more than 315 billion pounds of plastics that litter oceans. This is according to a zoo release. The announcement refers to the pollution as "the ocean's deadliest predator -- trash." Mary Hagedorn is a Smithsonian marine biologist and senior research scientist. She works at the zoo's Conservation Biology Institute. She is using fertility clinic techniques used for humans to save coral reefs. Coral reefs are being threatened globally by surging ocean temperatures. The coral are not only animals, but they also are habitats. "They are very complicated biologically," Hagedorn says, noting that coral reefs have some of the most restrictive reproductive schedules of any animals. The vast majority of coral species only reproduce once a year, for two to three days, and just 45 minutes each of those days. If coral stays bleached too long, it can throw off an already delicately balanced reproductive process. Hagedorn says coral already contributes $350 billion a year to the global economy. She sees promise in the "kind of chemical warfare" that the species use to fight one another as they compete for light (as trees do). "These antimicrobials are going to be really important in terms of our future pharmaceutical actions," she said. "They're a lot more than just a pretty face." "I've always thought that this should be a global project," she said. "We've created, in six years, 66 sculptures out of about 18 tons of garbage that just came ashore in a 300-mile stretch. And it's only just a few people picking it up. What if we got people around the world picking up garbage?" How is this art both serious and playful? This art is both serious and playful because of many reasons. It is serious because the exhibition reflects on the more than 315 billion pounds of plastics that litter oceans. It is also super playful because it is up cycling that looks like a giant beautiful blue fish. I enjoyed this article, but at the same time, I was disappointed that over 315 billion pounds of litter was found in the sea. Angela Pozzi made this the exact same year her father died. 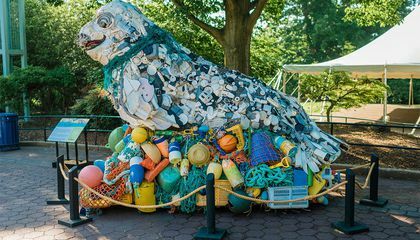 This article, ''There's a bunch of animals at the zoo made out of ocean garbage,'' is very inspirational to everybody to not litter but it is also very artsy crafty. I enjoyed Angela Pozzi article and I hope everyone else enjoys it as well as I did. In response to "there's a bunch of animals at the zoo made out of ocean garbage," I agree that the art is both serious and playful. One reason I agree is that the art is colorful and fun to look at, but, it raises awareness about ocean debris. Another reason is that while younger kids will love the playfulness to this art older kids and adults will get the seriousness. It says in the article "I need to reach inside of people," she says. That doesn't mean doing away with scientific facts. "But you have to grab them. And you have to make them care and you have to get their attention," she says. This says that the goal is to make it fun, so people can understand the seriousness of this. Even though very few people really understand the impact of trash in the ocean, I think this can help people understand the impact of trash. It is serious because it represents how much trash is polluting water everywhere, But it is also playful because the statues are very cartoon-ish and colorful. Because it is made out of trash. I was really shocked when I read that we have over 315 billion pounds of garbage in our seas. 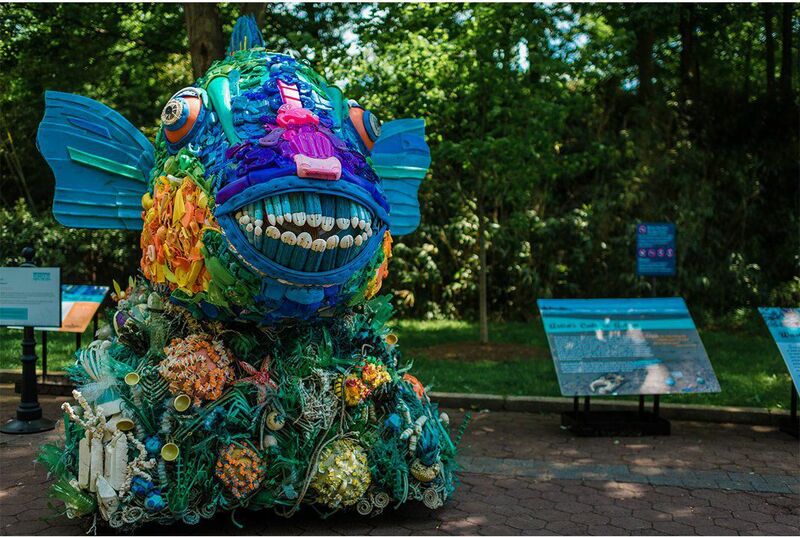 So I think it was a really good idea from Angela Pozzi to create animals out of garbage from the seas to connect environmentalism with the art world. This kind of art has a message and it reaches people on the inside. We have to do something against the garbage, because it is not good for coral reefs and fishes, because the often eat the plastic accidently. This article shocked me, but it also gave me some hope, because the artist said, that they have created, in six years, 66 sculptures out of about 18 tons of garbage that came out of the seas . And there were only a few people picking it up. So what if we got many people around the world picking up garbage? Maybe we could pick up most of the garbage, but we also have to stop throwing garbage in the seas! In response to " There's a bunch of animals at the zoo made out of ocean garbage", I agree that the sculptures at the Smithsonian's National Zoo are both playful and serious. One reason I agree to that is because the animals are made of many colorful items, and created in a manner that suggests both fun and creativity. Another reason is, the fact that all 66 sculptures are made of 18 tons of garbage washed up on the beach, really says something about the global problem of trash in the ocean. It says in the article, " It stands on a base of just the sort of entangled fishing gear that claims the lives of many ocean birds." which leads me to my third reason, going from this statement, I can infer that this would apply to most of the other trash-animals, if not all of them. Meaning that this was also meant to raise awareness about what we throw into the ocean and where, because the different species of animals will mistake different types of trash as different things. Even though the article states that the sculptures were made with a lot of creativity and seriousness, I agree that the sculptures were made for both the fun of it, and to raise awareness about trash in the ocean. It,s really enspireing to see that people turning trash into beutifull artwork. The art made out of trash is serious because it shows people how much trash we put in our ocean. It is also playful because the bright colors and size shows that we can recycle our trash instead of throwing it out our car windows.